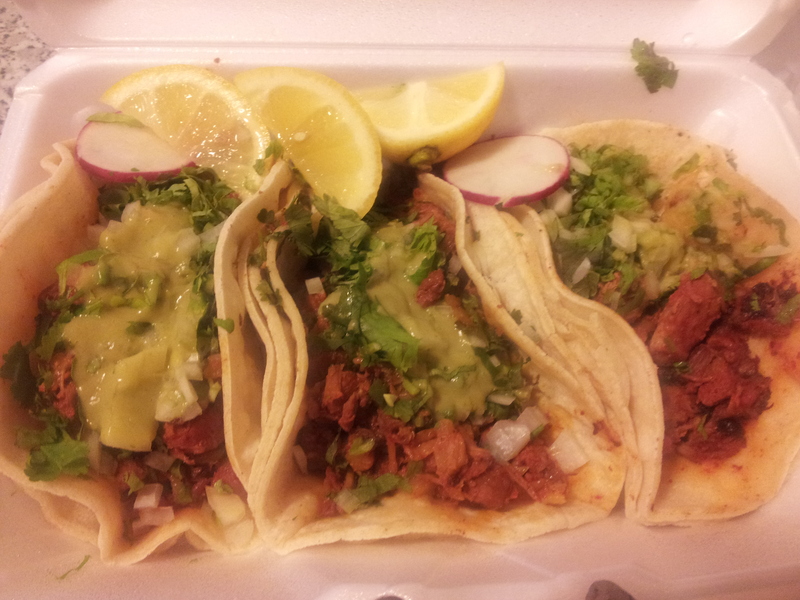 Here’s a look at last night’s tacos from Tacos La Carcachita, home of the best cemitas in almost-Ridgewood. You may have noticed the Carcachita truck’s absence for the past week and a half (due to repairs) — and in its place, the loaner waffle-wich truck that advertises “private and corporate waffling” (haha). 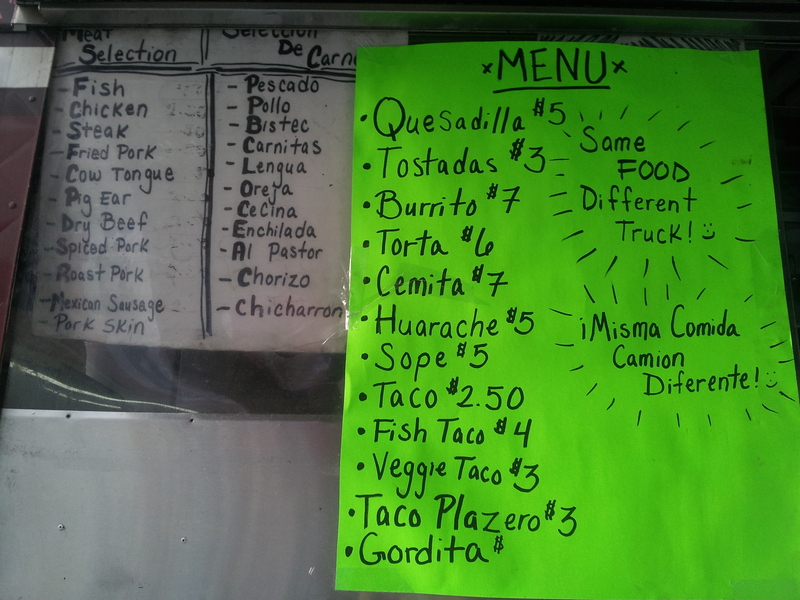 The menu assures us: “¡Misma Comida, Camion Diferente!” (Same Food, Different Truck!). Here’s a few more details for the cart nerds: We observed that La Perla Mexicana was TLC’s stand-in for the first day, but when the waffle truck took over, La Perla moved down Wyckoff just on the other side of the Myrtle-Wyckoff subway station. We thought it might be there permanently, but now it seems to be gone again, possibly for good. Let us know if you see the truck re-appear! 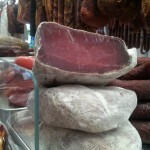 We actually intended to visit La Perla last night, but sadly we may have missed our chance. 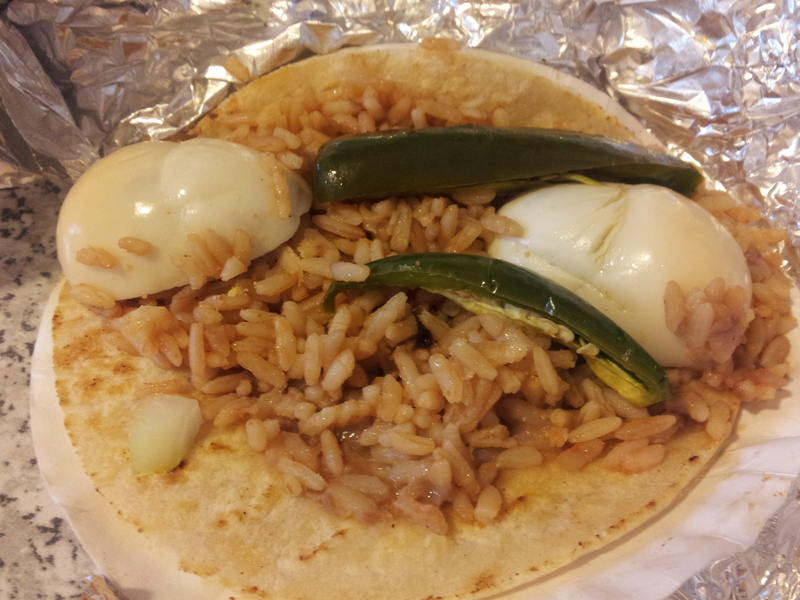 Taco Plazero: hard-boiled eggs and jalapeños. Kind of weird. Anyhoo. We ordered five tacos: veg, fish, al pastor, steak, and, on a whim, the cool-sounding “taco plazero.” All the tacos were huge and filling, and we enjoyed the fish ($4) and al pastor with charred bits ($2.50) the most (steak needed a little salt but was otherwise tasty). 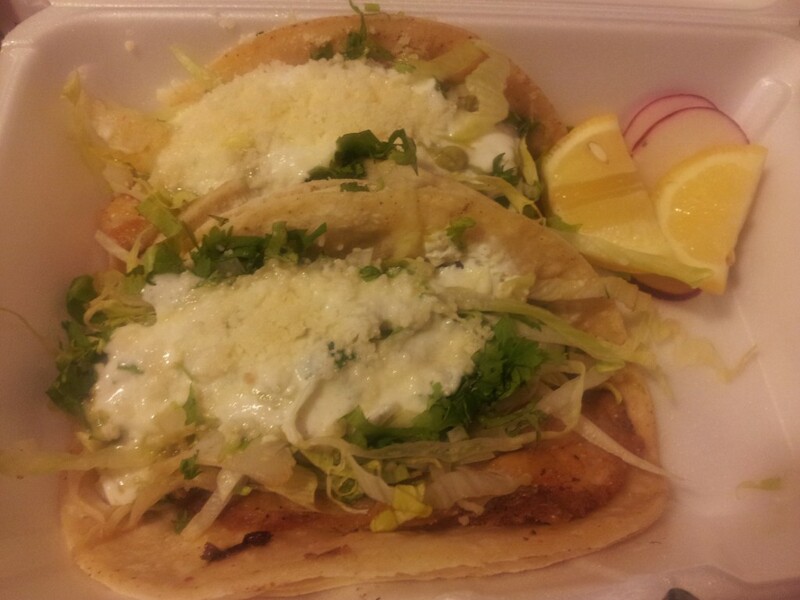 We still prefer Taqueria El Paisa for tacos, but they don’t have fish there so try the ones at TLC and you’ll be happy (as long as you don’t expect them to be the best fish tacos ever). 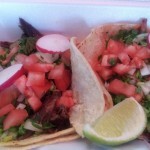 Our chief complaint about the tacos is that some of the tortillas were soggy because of ingredient wetness/oversaucing AND the steam created by the styrofoam container on our walk home, so you may want to enjoy your tacos cart-side or quickly settle onto a bench in nearby Venditti Square and eat them there. 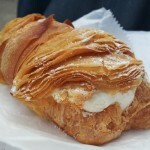 We’ll wrap up Food Cart Month next week! Approximately five more carts to go, including some weekend-only ones that we’ll hit up Saturday & Sunday.